The Royal Ploughing Ceremony dates back over seven hundred years, with a brief interruption in the 19th century. The present King revived it in 1960, continuing a long royal tradition of ensuring the success of the new year’s rice planting season. With half of Thailand’s people still dependent on farming for a living, the Royal Ploughing Ceremony is an important yearly event that honors the bond between the King, the government, and the farmers who sustain the country. The Cultivating Ceremony, or Phraraj Pithi Peuj Mongkol. here, the Lord of the Harvest blesses the rice paddy, seeds, and ceremonial items to be used for the Ploughing Ceremony the next day. The King oversees this ceremony, also supervising the blessing of the Lord of the Harvest and the four Celestial Maidens. He also gives a ceremonial ring and sword to the Lord of the Harvest to use in the next day’s ceremonies. This ceremony is performed in the Temple of the Emerald Buddha, within the Grand Palace complex. 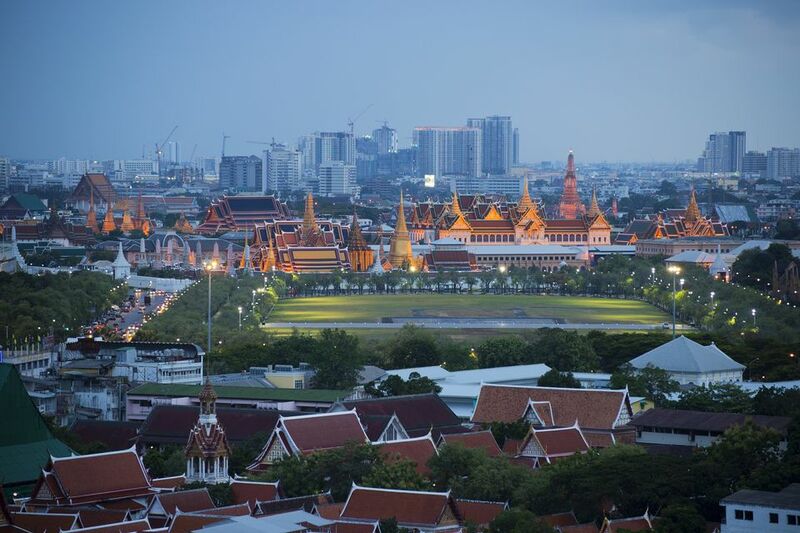 (For a more complete look at the Grand Palace complex, explore our Grand Palace Walking Tour). The Ploughing Ceremony, or Phraraj Pithi Jarod Phranangkal Raek Na Kwan. Held the day after the Cultivating Ceremony, the Ploughing Ceremony takes place at Sanam Luang, a plot of land near the Grand Palace. The Lord of the Harvest performs several rituals that are supposed to predict the conditions in the rice season to come. First, he chooses one of three cloth garments – the longest one predicts little rain for the coming season, the medium one predicts average rainfall, and the shortest one predicts a lot of rain. Afterwards, the Lord of the Harvest initiates the ploughing of the ground, accompanied by sacred bulls, drummers, umbrella bearers, and his Celestial Maidens bearing baskets filled with rice seed. After the bulls have ploughed the earth, the beasts are presented with a choice of seven foodstuffs – their choices will predict what crops will be plentiful for the season to come. At the end of the ceremony, the Lord of the Harvest will scatter rice seed over the furrows. Guests will try to gather some of the scattered rice grains as good luck charms for their own harvests back home. at their telephone number +66 (0) 2250 5500, or via email at info@tat.or.th.